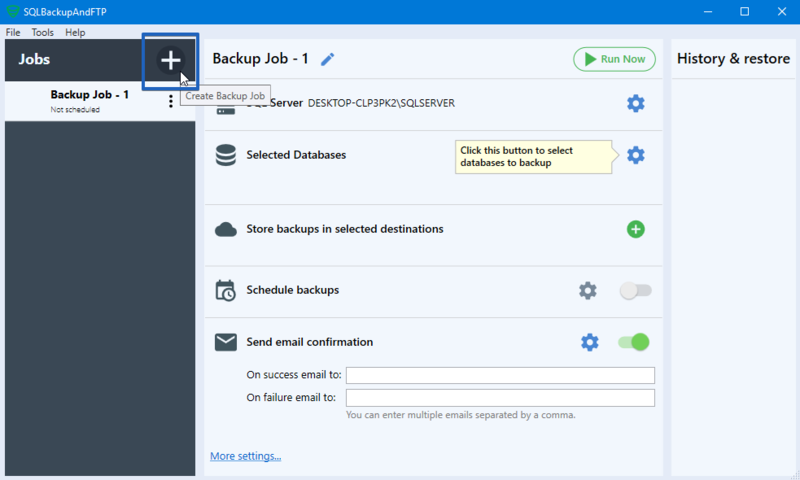 This article is an easy step by step tutorial and it will explain how to easily backup multiple servers and the databases that you want, while using SQLBackupAndFTP. 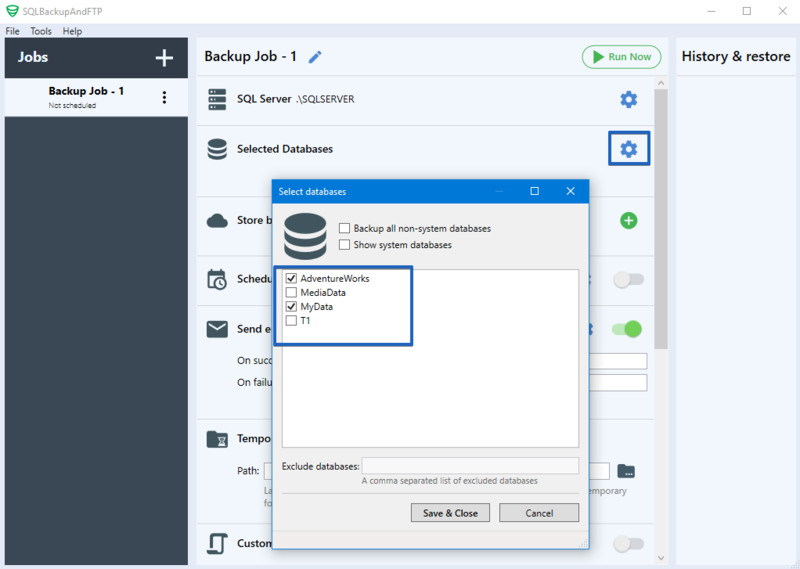 In order to backup multiple servers with SQLBackupAndFTP, all you have to do is create a new job for each server that you want to backup databases from. Thus if you want to backup 3 servers, you will have to create 3 jobs. 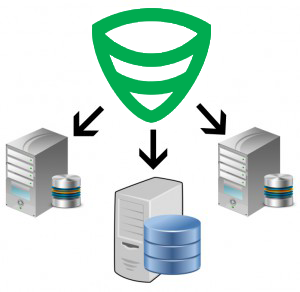 Below we will try to exemplify what are the generic steps you should take to backup multiple servers with SQLBackupAndFTP. You start SQLBackupAndFTP and create a New Job by pressing the plus button (as displayed below). After creating this new job you must first connect to the database server (SQL Server Instance) in order to have access to the databases which are going to be backed up. A smaller window will appear automatically where you will have to select the Server Name you want to connect to, from the drop-down list. Input the required User name and Password in order to connect to the server instance. 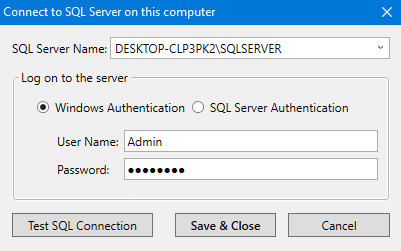 If the connection was successful the name of the database server should appear in the “SQL Server” section. The list of databases available on this server will be displayed after you click the gear button. Select which one you want to back up. Also, do not forget that the process is not yet complete without selecting an appropriate Backup Location, setting a Schedule for this Backup plan and other best practices which we recommend. After completing all of the details of your job we recommend to test the job by pressing Run Now. If the job runs successfully and if the backup file is created correctly then everything is finished. All you have to do now is to press the “New Job” button and restart the process from the second step and continue this workflow until you have created backup jobs for each of the servers you want to back up. If you have any questions or problems please feel free to post a comment on this article or visit our Forum. Which Feature/Edition in https://sqlbackupandftp.com/features can do this kind of backup type (Remote SQL Server) and how many servers that I can back up if I go with Professional Lifetime edition? I’m not too clear how it will work the Professional Lifetime edition. Will I have to renew every year $399 if I buy this edition or just pay one time $399 and It will work forever? All editions of SQLBackupAndFTP can backup Remote SQL Server databases, and there are no limitations on the number of Remote SQL Server instances you need to back up. If you’ll backup Remote SQL Server instances using SQLBackupAndFTP then you’ll get SQL-script instead or ordinary .bak file. We recommend using this mode in special cases only. SQLBackupAndFTP is a standalone application. Once you bought a license it never expires, and you can use the version you’ve purchased forever. The subscription is optional and requires a yearly recurring fee. SQLBackupAndFTP Professional Lifetime edition includes free lifetime Full-Service subscription.